Our daughter, Ella, who will soon be four, has a rare genetic condition. 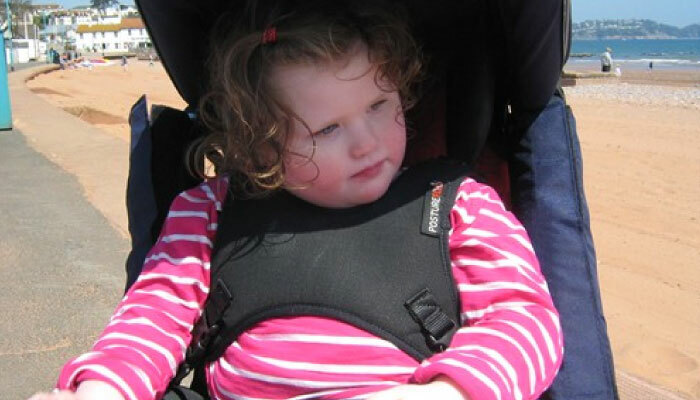 Her life is extremely restricted by severe epilepsy, which poses serious risks to Ella’s health and development. Despite the challenges faced, Ella remains a happy little girl and tries hard to resist the pressures which she faces. The constant 24/7 home care is massively demanding and requires a lot of time and energy, often resulting in long periods of isolation and exhaustion. Sadly, our financial independence has also been badly affected and we currently face a very long and uphill struggle. We first heard about the Torbay Holiday Helpers Network (THHN) through our family support worker at the Rainbow Trust charity. Jayne thought a holiday would give us a break from the daily challenges we face, caring for a disabled child with complex medical needs. We have now enjoyed a wonderful holiday and are deeply touched by the kindness of all of those who are involved in the running of the Hotel De La Mer. The time away in Babbacombe has given us quality time with Ella, away from some of the challenges which we normally face, on a daily basis. The week included three glorious days of sunshine, which meant we were able to take Ella on the beach, for the first time; sit in the park and go for some wonderful coastal walks. In addition to the free holiday accommodation and meals, we were given a welcome pack which had a vast amount of local attractions and services businesses had kindly given their services free of charge. Angels Tea Rooms, Babbacombe for the delightful cream tea we had. Hanbury’s Fish Restaurant, Babbacombe for the amazing fish and chips. Cliff Railway Café, Babbacombe for the tasty sandwiches. We have many fond memories of our holiday and feel very lucky that we were given the opportunity. Thanks again Luke, his family, THHN and all the other people who made our week very special.